Chances are that you have experienced bullying in your life. Whether your experience was as a victim, a bystander or the bully -if you search your memories, you’ll probably find instances when bullying was a part of your life. For many of us, these experiences have defined us and shaped us. Our experiences made us stronger, and helped us become who we are today. When you are being bullied, it is hard to think about much more than just getting through today. For others …there is no today. Their experience of being bullied was too overwhelming and it drove them to a devastating and permanent solution to the pain. Through a community partnership with Stand For The Silent along with our Writing for the Soul Workshop™ programs, we collected stories, art and poems from children & adults around the world. The result was Volume I of The Bully Diaries. Writing for the Soul Workshop™ is committed to impacting communities in a positive and meaningful way. We know that great programs require funding, which is why we offer fundraising opportunities for all organizations. 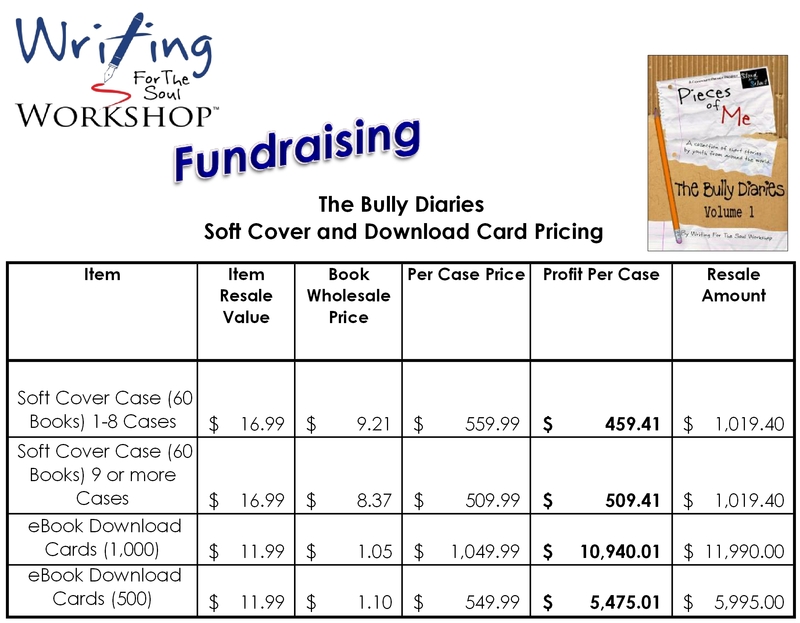 Unlike many other fundraising opportunities that earn 30-40% profit, our soft cover books offer almost 100% profit, and our eBook download cards offer profits of over 500%. Why do we do it? Our founders vision is to impact a billion lives, and give away a billion dollars …while impacting communities around the world. * Equip the local area youth that you serve in your community with a meaningful way to earn commission. This allows them to buy the things they need, save for college and so much more. What are the benefits of fundraising through Writing for the Soul Workshop™? * High quality, perfect-bound soft covers to sell. #thebullydiaries Project provides fundraising opportunities for ANYONE, including parents, coaches, teachers, persons with disabilities, mentoring organizations and youth that desperately need to earn extra cash. When you all earn, so does Stand For The Silent. 20% goes to help them continue to end bullying everywhere. So far, they’ve presented their story to over a million children & adults in person. We are committed to working in the trenches to generate as much in book sales as we can to help them. Fill out the Contact Form below to begin the process of placing your order as a Fundraiser, express shipping is available. You can also use the Contact Form below to sign up as an Affiliate to earn commission promoting #thebullydiaries Project. If you have questions or need more information, please don’t hesitate to reach out to us at 816.516.0974.